Now that the gallery exhibit is over, I could get back to some other summer activities. One item that I wanted to get completed prior to the exhibit was a presentation portfolio. Art Calendar talked about the importance of having a portfolio that stands out. What better way to have a portfolio stand out than to have it be a demonstration of my work at the same time? So, I created the cover to the portfolio first. Rather than have the portfolio have lots of paper, I opted to create a design that would allow for business cards, postcards, digital media, and some single pages of information. Given the cover size, I figured I would make the single pages be an odd size (8 inches square). So, the next piece was figuring out the dimensions of the page. Because I might use a standard CD or a mini-CD, the design needed to accomodate either. I first worked with paper to get my "template" measurements. I settled on two "pockets" that have stitched dividers in them. I opted to bind the outside edges of the "page". I had some leftover "blades" from the fan project and wanted to use them in this portfolio as well. Then, I had to figure out how to attached the front to the back. I made a tube out of the binding fabric and sewed it to the back of the "page" and then both fused and hand stitched the tube to the back of the front page. Finally, a trip to Shipwreck beads and I found the beads that I wanted to use to wrap the blade ties around. I've been having a bit of lull in my own fiber creations. I did contribute two quilts that will be on display at the Uhuru Quilters event on Saturday. You can see both Friendship is a Gift and Tropical Haze at that event, as well as 100+ quilts from other group members. Then, the exhibit is up at the Dadian Gallery and the reception is this week Thursday from 5 to 7 pm. Dadian is on the campus of Wesley Theological Seminary at 4500 Mass. Ave NW. I am making myself some new clothing. And, maybe one piece will be done and I'll wear at my reception. We will see. Portfolio - so that's what this stuff is for! As part of getting my solo exhibit ready this time, the curator wanted my portfolio. I had put doing a portfolio as part of my list of things to do, but hadn't gotten to it before she asked. So, I asked what was supposed to go into the portfolio. Her answer was that for the gallery's portfolio it needed to let the potential client see what was possible and the person who didn't know they could be a client an awareness that they could become a client. She recommended that I include images of other works and "tear sheets" of other press materials. Well, my last time dealing with "tear sheets" was in high school journalism class when we ripped out the ads that businesses had paid to publish and mailed it to them as proof of publication. Suddenly, I came away realizing that those copies of the program brochures for the quilt events that I had been juried into were exactly the stuff she was talking about. I also included communications with clients and information about my design processes for different works. When I thought that I didn't have much for a portfolio, it turned into quite a big collection. I still want to do a more artistic portfolio too, which will not be as big as the package I gave her. The cover for the artistic portfolio is done, now just to get back to that effort. On another note, the Washington Post listed my exhibit! It was listed in the coming events in the religion section (I think) in the Saturday, May 24th, 2008 edition. As part of getting ready for this latest exhibit, I was asked for information that could be used in a booklet that patrons of the gallery can use. I was grateful that I had some information for the quilts that have been in other exhibits or on my website so I could use that stuff. For the newer works, I had saved the info that I put into the label on the back of each piece. It was really accidental that I had kept that info, but it was good to be able to use it for this need too. The works have been installed at the Dadian Gallery. You can check out the exhibit and more details here. Thirty one pieces have just left my home to go be part of the Dadian Gallery exhibit. It is always hard to sort through the work and have them leave. I am really glad to be working with a great curator, Deborah Sokolove, this time. It's a real treat to work with a curator and not have to do all of this myself. I made sure every single piece has a label with title and contact info to make the curator job's easier. I like the way that this piece adds my interest in Asian design. Some of the fabrics were from Kona Bay. I think my sense of design space is influenced by my life in Tokyo. I wasn't a fiber artist when I lived there, but I did appreciate their art and practiced shuji. I guess one of the issues that I have with the way that this ruler operates is that it generates a lot of "wasted" materials. Now when I make a piece, I do try to keep the fabrics together and make other pieces using those color combinations and "wasted" materials. You'll see a few of the other pieces in the next few blogs. Tulle or Bridal Illusion for quilting designs? I have been doing a bit more of facing a quilt rather than binding the edge. In part, I think it works a bit better with a curved edge and sometimes I just don't want to see that extra lump around the edge. Facing is a garment making technique that gets used a lot with edges and especially curved edges like necklines. There are a few articles out about facing quilts. The most recent article I have found is on Jeri Rigg's blog. I've seen two other articles on the technique as it pertains to the quilting world, one in Quilting Arts Issue 31 called Whole Cloth Facing written by Vikki Pignatelli and one was a project by Kathleen Loomis in the American Quilt Society materials. 1 found inspiration in curves: the curved line of a fence and the curves on a windmill. Today we went and saw windmills worki ng. We have been traveling in the Netherlands. Traveling is different with a three year old than with only adults. Our first night, we could admire the dance of two ferry boats across a canal. On each side, they would load up with cars, bikes, motorcycles or walk-on passengers and then they would both leave the shore. They would spin in the middle of the canal and then dock on the other side. We watched this dance for quite some time. Our second day, we walked along the river and watched the boats and drawbridges. Between two drawbridges was a lock and we watched that too. Large barges would enter the lock. Sometimes the barge had another boat on top of the roof of the cabin and sometimes it had a car. This was in addition to its normal load. We went to the family event and our three year old played happily with cousins around hrs age. We had some family time the day before and it was good to see how my aunts and uncles interacted with him. The article focused on how everyone has a difficult time limiting their options, even when doing so would be more "rewarding". 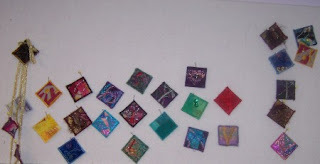 I find that there is a creative cycle to my art work and evidenced in my studio. There is an odd balance of creative chaos that, at some point, turns into chaos without creativity. At that point, I take the time to straighten things up, put things away and start over. But, I don't always apply the limiting options to my design wall. So, I took down a number of the items that have been hanging on the design wall this morning. I have one quilt to machine quilt and then can work on what is on the wall. I still couldn't limit myself to one item though. I realize that I need to do so, but just am resisting it so far. And my brain wants to use the emptier wall as a place to put up a bunch more new things. Again, I too am irrational and cannot handle the loss of options in favor of the benefit of focus. Then, in April, Cloth & Chocolate will have a group show at the Friendship Heights Community Center. Plans are underway for that exhibit. And, another exhibit for Cloth & Chocolate will happen in September. In between all of that, I have my own solo show to get ready. When it rains, it pours. In the middle of having a lousy cold that made it hard to see, I just now have had some time to work on a new piece. I have a group of friends in http://www.clothandchocolate.net/ with whom I exchanged Plus Sized Inchies (PSI's). A few of the other members of the group had started to make quilts with their PSI's. Now that I had quite a selection (and I think I still have a few more coming), I needed to devise my own approach too. It was nice to be able to borrow the tucking concept one group member was playing with for this piece. That gave me some opportunities for "window panes" to highlight a number of the PSI's and make them stand out. The borders are irregular and are areas where o ther PSI's can be added. The row of PSI's on the right will dangle. I partially quilted the base of the design before adding borders. 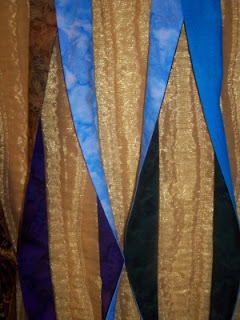 The quilting on the gold cotton fabric is meant to emulate ribbons. The first one I list is the one I use a lot for ideas. I find that I have to double check their numbers before cutting things, as they sometimes don't include seam allowances in their measurements. Last night I went to the FriendshipStar Quilters guild meeting at heard Mickey Depre. her blog is here: http://www.quiltartistwithyarn.blogspot.com/ She was a very nice speaker, down to earth, sharing, creative, what else could you ask for? She did her lecture on Tips and Tricks and had a small trunk show too. 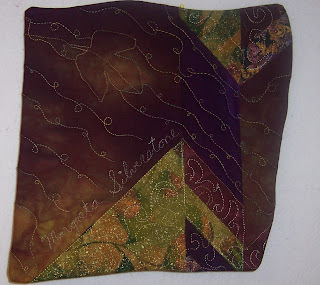 I really liked the use of the quarter inch strips of steam a seam to help with making a sleeve on your quilt. Why sew it if you can fuse it? I took two pieces to the photographer on Friday and will get to pick up the images this Friday. I'll get to flip one CD to the Dadian Gallery where I will be having a solo show this summer. Yippee. Now, if I could just find more time in the studio. Just a quick note that I continue to work on the new design for my website and may have it up in a week. I hope you will enjoy it. And give me comments too. http://www.electricquilt.com/Users/FunStuff/RoundRobins/RR.asp - lots of images of quilt designs that are round robins. I hope to add some book resources in the future. I find it fascinating that about once a month or more I get an email from someone with questions about round robin quilts. I think the easiest way for me to record my responses to these emails, and inform others, is through this mechanism. Rules never seem to protect us from relationships. It is great to be clear about the rules and be clear on the expectations, as best you can. Do you, as a group, want everyone to stay in their regular skill zones and just work on the challenge of fitting their work into the work of others? Do you value technical accuracy more than anything? Do you value challenging yourselves on all fronts? While you can help yourselves by being clear on these things, it won't protect you from the relationships (or that one person's definition of accuracy is different than another's). Give yourself a little space. If you can work into the design some spacer borders or pieces, you give yourself some breathing space from other people's expectations and abilities. You may want that space because you personally don't like what the other person did. You may help the next person in the progression if they aren't quite happy with what you did. I am in the process of redesigning my www.margreta.com website and will add this blog as part of that effort. Part-time Fiber Artist with work in international and national exhibits, private and corporate collections. Today we went and saw windmills working.